Tibet's exiled spiritual leader the Dalai Lama addresses those gathered at Buyant Ukhaa sport palace in Ulaanbaatar, Mongolia (November 20, 2016). Since the 13th and 14th centuries, the Mongolian Empire has allowed merchants, scholars, diplomats, and religious peoples from all over the world and treated them equally on a diplomatic and people-to-people level. A large number of Mongolia’s population has practiced Buddhism in a way to bring peace, morality, and ethnic values to society. As religious rights are a fundamental part of democratic governance, Amendment Nine in Mongolia’s 1992 constitution protects the “liberty, opportunity, and freedom of religious activities” of its citizens. On November 18, 2016, the Dalai Lama’s visit to Mongolia created somewhat expected tensions with the Chinese government. A number of press releases illustrated China’s strong opposition to His Holiness’ visit to Mongolia. However, the Communist Party of China (CPC) should recognize the reasoning behind the Dalai Lama’s visit. These explanations will create a clear understanding of Mongolia’s domestic and foreign policy in our contemporary geopolitical environment. 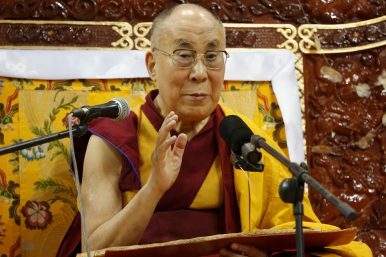 First and foremost, the Dalai Lama’s visit is not a China-Mongolia bilateral issue. It is Mongolia’s internal, domestic issue, concerning the people’s rights under its Constitution. In accordance with the Mongolia’s constitutional rights, citizens of Mongolia, particularly those who believe in Buddhism, have the rights to accept, allow, and appreciate the visit of His Holiness. The Dalai Lama was invited by the Center of Mongolian Buddhism, the Gandantegchinlen Monastery, and was accepted by the people. If the current hostility stemmed from a bilateral issue, it would be logical for the two countries’ foreign ministries to solve their differences. However, since this is a not the case, the antagonistic language released from China’s Foreign Ministry has put a damper on people-to-people affairs. As for Mongolia’s foreign policy, the Dalai Lama’s visit is not concerned with Tibetan separatism. The Mongolian government believes in the one China policy, which includes Tibet and Xinjiang, and has always refrained from interfering in China’s domestic affairs. On the other hand, the Mongolian people expect the Chinese government to acknowledge and respect Mongolia’s Constitution and religious freedom. However, it is understandable to some extent for the CPC to react in an unwelcoming way. Due to its own instabilities in the autonomous regions, such as Tibet and Xinjiang, the Dalai Lama issue is extremely sensitive to the CPC. After the Dalai Lama’s departure, the Chinese government has retaliated economically. Beijing has threatened to close its borders with Mongolia, to increase the economic hardship the country is going through. Also, as a method of “punishment,” the CPC has increased import taxes, postponed high-level government meetings, and undertaken other financial measurements. In response, the Mongolian government has repeatedly clarified Dalai Lama’s visit is a non-governmental affair. If government officials attended the religious ceremonies, it is their individual right as citizens to do so. Weeks later, the Chinese Foreign Ministry has continued to issue press releases condemning Mongolia for its actions without showing respect for and acknowledging the constitutional rights of the peoples and religious freedom within the country. From Mongolia’ standpoint, it behooves Chinese foreign policy to accept and respect Mongolia’s Constitution and citizen’s rights to invite whomever they wish to conduct religious ceremonies. Therefore, these exaggerated reactions have allowed China to impose their national interest on Mongolia in an unsettling, harassing way, which a good neighbor shouldn’t do. China’s exaggerated reaction, once again, illustrates China’s aggressiveness in its foreign policies toward its neighbors. Beyond neighboring Mongolia, China has condemned India, Slovakia, and the European Parliament for accepting visits from the Dalai Lama. Finally, from a geopolitical standpoint, it is in the best interests of both China and Mongolia to continue their diplomatic, good-neighbor relations at both the government-to-government and people-to-people levels. Since 2015, China and Mongolia have concluded a number of agreements that are beneficial to both countries’ economies, infrastructure, and agricultural sectors. Moreover, by maintaining a good neighbor status, the Russia-Mongolia-China trilateral can boost Northeast Asian economic initiatives in the upcoming years. On December 20, 2016, to ease up the situation, Mongolian Foreign Minister Ts. Munkh-Orgil stated Mongolia’s position on the issue and pledged that the Dalai Lama will not be visiting Mongolia again for the duration of his time in office. However, as stated above, the decision to invite His Holiness is protected by the Constitutional rights of the people, and it will continue to be protected. The CPC must recognize and respect Mongolia’s Constitutional rights in this religious and internal matter. Bolor Lkhaajav is pursuing a Master’s of Arts in Asia-Pacific Studies at the University of San Francisco, and was formerly a Security Analyst with Horizon Intelligence. Buddhism in Mongolia has always had a strong connection to geopolitics. A Conversation With Mongolia's Foreign Minister Tsend Munkh-OrgilThe Truth About Mongolia's Independence 70 Years AgoThe US Is Pushing Back Against China. What Happens If We Succeed?On Looming US-China Trade Deal, Actions Speak Louder Than WordsTrue GRIT with North Korea?